I'm sitting in my hotel room, recuperating from the 2014 reunion of the Navy Musicians Association, getting ready to pack up for my trip home tomorrow and already wondering: what will next year's reunion be like? Last year's get-together was--here comes that word again--stellar. I know I've mentioned this before, but after the 2013 reunion, when the gear had been torn down and the last toasts offered, I heard a number of members say, "Something was different this year." It was true. We had new members in 2013. We had a fine concert band and swinging big bands. We'd also been attracting some excellent new players, performers of widespread repute. It was a clear sign of our brotherhood that these hot new players didn't scare the rest of us off the bandstand. To the contrary, in concert band, big band and in jam sessions, we played together as comfortably and enthusiastically as ever. The affair was so good that, through the ensuing year, I feared that 2014 might be a letdown. I couldn't see how we could top the 2013 reunion. But we did, and I think scores of attendees would agree. We hit our stride quickly. The first day of our reunions can be rugged. But last Wednesday morning we set up the rehearsal hall in record time and were playing by 0920. Similarly, a volunteer setup crew got the concert band room set up and rehearsal began within minutes of the scheduled start time. And the rehearsal hall was full; those hot players who were first-timers last year? They were back. The result was a series of effective and enjoyable rehearsals that culminated in--here's that word again--stellar performances. of service in every decade in between. The quality of our big bands is no surprise. The NMA concert band presents a different challenge. This genre of music can be complex. Every piece is completely different. You can't rely any type of "autopilot" when a conductor is steering the band. Until the players arrive and warm up, you never know what instrumentation we'll have--or not have. But this year, along with challenges, we had solutions. Wonder of wonders, the NMA had a full section of B-flat and alto clarinets. And timpani--four of them! Music stands that don't collapse under the weight of a pencil and spare mouthpiece. And because Wilbur Smith, our director, is still regaining his strength after back surgery, Ray Ascione agreed to conduct a few numbers, providing a rest for Smitty and lending new excitement to our performance. And then there was the Saturday night performance by the ceremonial unit of the U.S Navy Fleet Forces Band. The caliber of this new generation of Navy musicians is astounding. Just as they did last year, their performance--and remember, we're talking about regular old stand-on-the-pier, change-of-command, B-flat "bag band " or "gun tub band"--demonstrated exceptional musicianship, military bearing and showmanship.. If I've been focusing on the musical aspect of this reunion simply, it's only because it's easier to talk about music than spirit. It's hard to describe the camaraderie, the joy of spending a few days with friends you knew in your first band, or that you're meeting for the first time. But that spirit was everywhere, on the bandstand, in the lounge and under poolside umbrellas. So how will things go next year when we return to Virginia Beach next year? First-time attendees are coming back for seconds, so clearly, the word about our reunions is getting around. And a special added attraction is on the horizon: the 2015 reunion will mark the 20th anniversary of the Navy Musicians Association. This could bring in new-comers, old-timers and once-in-a-whilers. Yeah, I can see next year's reunion being even better than this year's. The only thing I can't see improving is the Fleet Forces band; the thought of them topping this year's performance seems inconceivable. Of course, that's exactly what I said last year. Although the reunion is over, I'm still wrapping things up. Tomorrow is a travel day. Then it's back to my other life. So it's gonna be a few days before I can post all the videos, photos and blather about the 2014 reunion of the Navy Musicians Association that I want to share with you. As worn out as I am, there's still a lingering "high." So tonight I'll post a few things while they're still fresh, things that made the 2014 NMA reunion...I was going to say "stellar," but that was how we've referred to the 2013 reunion. This year, I'll need an adjective beyond "stellar," since this get-together topped even last year's reunion. I'll be back tonight with the new adjective. I will have much more to share about the closing dinner/dance of the NMA reunion. I'll have much more to share about the whole thing. But it's late and this is my last chance to run down to the lounge for a last farewell. I'll be back tomorrow with more photos and recollections. ...because a family isn't just people related by blood. We are related by heritage, history and service. I'm now preparing for the second of the week's highlights: the Saturday night dinner/dance of the Navy Musicians Association reunion. Last night's concert was tremendous, but still, it was "us" playing for "us." We're our own greatest audience. which is just as it should be. We're not out to impress anyone. We're not auditioning for a gig. We're sharing our bonds of service and camaraderie the best way we know how: through music. U,S, Navy Fleet Forces Band at the 2013 NMA reunion. But tonight will be different. The U.S. Navy Fleet Forces Band (formerly known as the CINCLANT band) is scheduled to perform for us. We've heard these men and women play before, so we know what to expect: excellence. They deliver it every time. But it still astounds. We've got an afternoon of liberty before this evening's dinner/dance. Having some free time, I thought I'd wander the hotel and see what's what. What I found was a working party. Leon Harris, our Equipment Manager, was checking the wiring on the bandstand. He wanted to be sure our Big Band players have plenty of juice for their stand lights tonight. Each of those stand lights needed to be checked and hooked up. Rich Eastman, who hadn't been to a reunion in a few years, was on the job. People like this make our reunions work. Leon, a member of the Board of Directors, and Rich, a guitarist who cares about his shipmates, both spent their precious free time making sure that things would run smoothly for their shipmates. I know I've spent a lot of time focusing on our concert band, but the contributions of the NMA Big Band are important, too. This band rehearses morning and night, with players rotating in and out so everyone gets time on the bandstand. After the concert last night, the Big Band played a bit. And they'll play even more tonight. This will be the biggest bash of the week. The U.S. Navy Fleet Forces Band will entertain us, we'll have dinner and speeches and finally dancing to the NMA Big Band. Last night was just the preview; tonight, the dance floor will be filled. It was great to see Rich Eastman again. a new audience for the future. The General Membership Meeting of the Navy Musicians Association was a great success, if you define success by lack of bloodshed. For MUs, that's a reasonable definitions. Treasurer Cecil Strange reported that we are solvent. In my experience, solvency means getting a paycheck and not having to immediately disburse it to bartenders to cover the last two weeks' expenditures. President Terry Chesson reiterated his desire to hold the 2016 reunion in a central part of the United States, perhaps the Midwest, to attract members from a new region and to make travel easier and more cost-effective for members on the West Coast. Terry introduced Dennis Allard, who runs our Recruiting Committee. 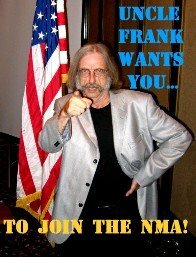 Dennis reported on fresh ideas for getting out the word about the NMA, and reminded us all that we, the members, are the best recruiters. I'd say we're even better than Navy recruiters; we know what we're talking about and we don't have to lie. The bottom line: we need new members. This reunion has been tremendously successful. In my opinion, it's been as exciting and rewarding as last year's stellar get-together. Continuing this success will require a steady infusion of new faces with new talents, ideas and sea stories. We were blessed with a good number of first-time attendees at the reunion this year, and I was glad to hear them share their ideas. It's often difficult to walk into a new organization and feel comfortable expressing your opinion; you don't know if your idea is out of bounds, or whether it's been tried fifty times. On the other hand, we're all MUs. We've all been the new guy in a band who is bursting at the seams of his crackerjacks with new and old crazy and sensible ideas. Thanks for speaking up, guys. once called"Change of Command Face." whose job description includes the term "Morning Colors." Yes, I know everybody loves Frank's high-class professional photographs that bring the reunion alive. But sorry, none this morning. I'm preparing to head downstairs for the General Membership Meeting. Most of an NMA reunion is about music and camaraderie. But on the Saturday morning of every NMA reunion, we meet for an "all hands evolution" that includes reports, plans, thanks, things that may seem dry but are vital to a continuing and thriving organization. Generally, there is no bloodshed. Barring a trip to the emergency room, I'll be back with a report in the early afternoon. Just a brief sitrep here. The Friday night concert just ended, It was a huge success--many say the best ever . Due to a scheduling error on the part of hotel management, our final rehearsal this afternoon was cut short. This meant that late-arriving members who hadn't been to a previous rehearsal never had a chance to play through some of the music. But we are Navy musicians. We were trained to be flexible, to play with confidence, to sight read effectively, if not flawlessly. With everyone one their toes, the band peaked during performance. I'm going back downstairs to take some photos. Tomorrow I'll have free time--MUs are allowed to roam without supervision on Saturday afternoons--so I'll upload photos and maybe some videos of the concert. The time is passing waaaaay too fast around here. In a perverse inversion of logic, more clarinets are better than fewer clarinets. Not in Dixieland, perhaps, but concert bands benefit immensely from a full clarinet section. And our clarinet section is larger than ever this year, thanks to Melanie Leketa. While Mel was a vocalist in the Navy, she was willing to pitch in with her B-flat clarinet. presence of our newest clarinetist, Mel Leketa. This is a double blessing. Mel's presence not only fills out the section--it discourages anyone from suggesting that Terry Chesson join in. Soon to be available as a bumper sticker or bookmark. Inside the School of Music. to MU3 Tex Waldron in 1967.
has to listen to the yelling..
what is, as I recall, the Officer's Head. This morning we piled into a bus and drove to the Joint Expeditionary Base for a tour of the new facilities of the U.S. Naval School of Music. The Commanding Officer welcomed us with a brief overview of the changes that have been made. Updates to the climate control system have been a big issue. Three decades later, my body has not recovered from the three years I spent sweating, freezing and passing out in that building. We were up late last night. In a few minutes a bus and car caravan will depart from the hotel for a tour of the Naval School of Music. It used to be the Armed Forces School of Music, located on the Naval Amphibious Base.It's now called the Naval School of Music, located on the Joint Expeditionary Base. It's the same building in the same place--only the names have been changed. Actually, a lot has been changed. The original school building has been gutted and refurbished. Training is currently takes place in temporary quarters, but the redo of the school is so close to complete that the commanding officer invited us for a tour. I expect to have a plethora of pix for display soon. Here comes the bus.Gotta go, or I'll be late for school. Did you know that MUs know how to party? Nothing clears a room as fast as a rehearsal conductor uttering the phrase "Take ten minutes." Upon hearing this, MUs head for the door, for coffee, a phone call, a head call or just for the opportunity to shoot the breeze. I take that back. I believe there's one phrase that will clear a room even faster. As I recall, it is: "I need a couple of volunteers." Every time you walk through the lobby you hear more voices saying, "Hey, shipmate, when did you get here?" MUs of a variety of ages and eras keep walking through the door. This thing keeps getting bigger and bigger. Fortunately, there are always enough sea stories to go around. I usually don't post photos of the first concert band rehearsal; so many members haven't yet arrived that the rehearsal hall is a sea of empty seats. Not this year. Yesterday afternoon, the hall was full, the sound big. I'd say it was the best first rehearsal in memory. This augers for a sterling Friday night concert. We still have a few seats to fill, but people have been checking in all day. In fact, last night at 10:30 p.m. as I hopped in the elevator after the evening jam session, I met two first-time attendees who had just rolled in. Maybe they play the oboe and bassoon. Wilbur Smith, our concert band director, has some help this year. Ray Ascione agreed to conduct a few numbers in our concert, a great help to Smitty, who, despite his energy and devotion, is still recovering from surgery. Ray--"Mr. A." --was the Training Officer at the School of Music during my tour on staff 30-something years ago; he was my boss. A certain wonderful aspect of our reunions never changes; you run into old bosses and they're somehow young. Oh, when you first run into someone you worked for, he may look a little grey around the edges. But the next time you see him, he's lost ten years, and the next day he looks just like he did way back when. J.S. Bach, BWV 140: Wachet Auf, "Sleepers Awake." Right now, the concert band is engaged in its first rehearsal. Meanwhile, here's more from this morning's rendezvous with Sammy Nestico. "A Foggy Day at 0900"
Our sign-in total is still in double digits. This will change as members continue to arrive through the week. A short and sort-of serious note. I wish you were here. Every damn one of you. Only one day old, this reunion is already giant and continues to grow. Last night as I was heading for bed, I met two new members who had just arrived. I welcomed them and told them how the register in the morning. It reminded me of my first reunion. I'd debated for years about coming to one of those there MU reunions. Year after year I talked myself out of it. 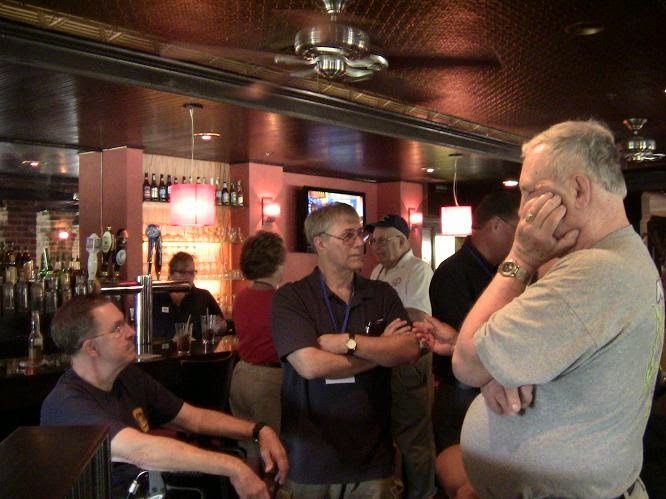 Finally, in 2006, with the help of an NMA member, I talked myself into it and drove to the reunion in Louisville, Kentucky. I was nervous. I knew some people, but most were strangers. I didn't understand the reunion routine. But MUs welcomed me aboard, showed me the ropes and I've been coming back ever since. Those who were strangers are now shipmates I look forward to seeing every year. This is how it works, my friends. So all I can do is tell you from the bottom of my heart: since you're not here, I have no choice but to have your fun for you. Here we go. Some of us are still a little hazy after an evening in the lounge catching up with each other, but we're all ready to get underway. This first morning of an NMA reunion is the shakedown cruise. It's been a year since we were comfortable with the daily routine; for newcomers, it's been decades. This reunion will be giant. Last night, the lobby was as full of meandering, B.S.-ing MUs as it usually is on Thursday afternoon. Considering the reunion hadn't started yet, this augers for a record-breaking turnout. Right now, folks are having breakfast, brewing coffee, showering, and, of course, B.S.-ing. We officially start at 0900. There'll be work to do, equipment to set up, music to pass out. It's the work we came to do, but it's work we enjoy, take pride in and do better every year. So in a sense, it's not work. "We need a bass player. Is there a bass player here?" "Don plays bass. Where's Don?" "I think he went to dinner." "How about Jimmy Mac? He's around somewhere." "He went home. He'll be back later." "He says he doesn't know changes." "Bull. He did a great job last year." "Okay, but you're the pianist. 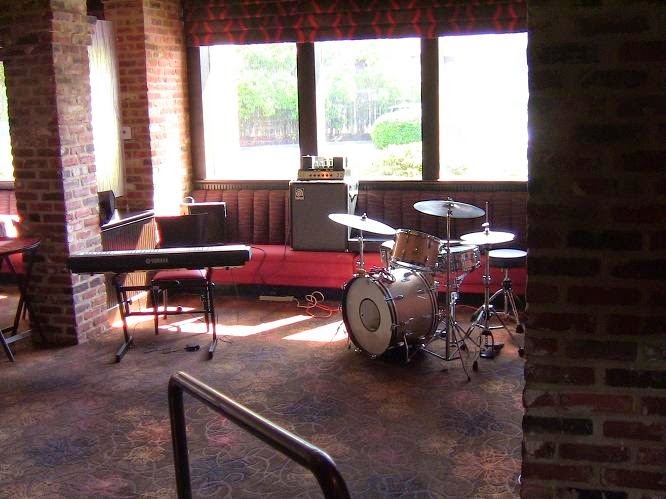 If you play bass, we need another piano player." "Don plays piano. Where's Don?" Check the rehearsal schedule. Read the Plan of the Day. Pass the word. All schedules are tentative. By 1630, the MUs have settled in. techniques of Randy Martell and Don Junker. "What about us?" wondered the gear. Soon comes the witching hour. First to Arrive? Not me.